Beginning Thursday, September 13, SR 768 will be closed to traffic between US 36 and SR 3 for approximately three weeks for work on the roadway and bridge deck surface. Traffic will be detoured through the square in downtown Mt. Vernon. SR 3 traffic will continue to the square and then follow US 36. US 36 traffic will continue to the square and then follow SR 3. COLUMBUS, Ohio (OFBF) – Kyle Smith of South Vienna is serving on the Ohio Farm Bureau Federation Policy Development Committee. The committee collects and organizes public policy recommendations from county Farm Bureaus and presents the final policy suggestions to be voted on by Ohio Farm Bureau’s delegates during the state annual meeting in December. Kyle Smith serves on the board of trustees representing farmers from 20 counties in southwest Ohio. CLEVELAND — Momentum is building around Steve Dettelbach’s campaign for Attorney General and the media coverage this week relayed that message loud and clear. For Auditor of State Dave Yost, it probably felt more like alarm bells sounding. News outlets across the state outlined key differences in the AG race including on the Electronic Classroom of Tomorrow (ECOT), the AG candidates’ stances on standing up for the millions of Ohioans with pre-existing conditions — in light of the Texas Obamacare lawsuit — fighting for LGBTQ equality, and battling the opioid crisis. And, Dettelbach for Ohio further increased its cash-on-hand lead over Yost. [Dettelbach] called on State Auditor Dave Yost, the Republican in the race, to publicly state where he would come down on the lawsuit. 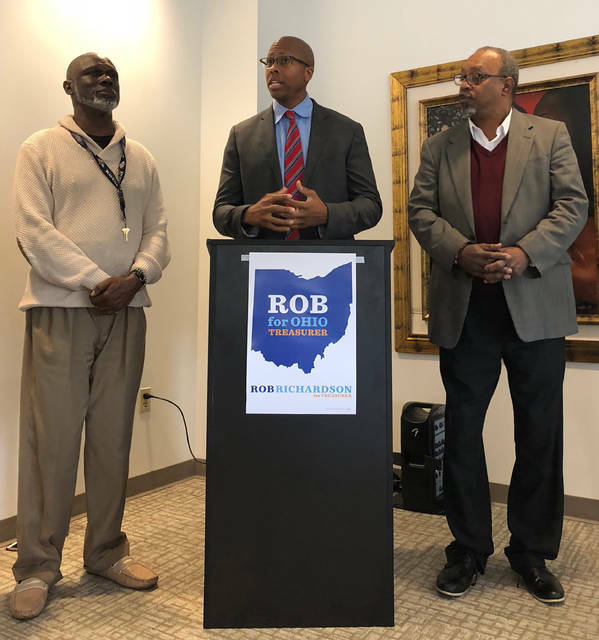 “The people of Ohio deserve to know which side their attorney general would take in this fight,” Mr. Dettelbach said during a conference call with reporters. “I would not be inclined to join the Texas lawsuit,” [Dave Yost] added. Mr. Dettelbach said he would join the case on the side of those defending the law. He said when an attorney general decides whether to get involved in a high-profile national case it should come down to a two-part test. First, he said, an attorney general should determine if a law is constitutional. In this case, the U.S. Supreme Court has twice found the ACA to pass constitutional muster. Weighing in: Democrat Steve Dettelbach says if he’s elected Ohio attorney general in November, he’ll apply a two-pronged test to determine whether to file or join a lawsuit challenging federal law and regulations. Dettelbach, who faces Republican Ohio Auditor Dave Yost, told reporters in a Wednesday phone call he would submit an amicus brief opposing a Texas lawsuit that could strike down the Affordable Care Act’s mandatory coverage for people with preexisting conditions. Republican Attorney General Mike DeWine has declined to take a side in the case. Dettelbach said he would be guided by whether the law is on the side where he thinks Ohio should be and whether the interests of Ohioans are served. #3: Again, on fighting for healthcare for all Ohioans especially women, whose rights are under imminent threat from Kavanaugh’s pending nomination, and the millions of Ohioans living with pre-existing conditions. Kavanaugh’s nomination will not just hurt women’s healthcare. It is also part of a broader Trump Administration effort to strip away legal protections for people with pre-existing conditions and older Americans. The healthcare rights and protections of Ohio’s most vulnerable are already under full-fledged attack from the Trump Administration and Republican majority Congress firing from all angles. Judge Kavanaugh’s nomination risks adding gasoline to the fire. Ohioans want and need balance. They do not need another institution actively working against them. Our leaders should work to move the state forward and make sure everyone who lives here has an equal opportunity to move ahead — an equal shot at fairness and equality. By hacking away at that idea of equality, we not only see the rights of Ohioans dissipate — we see the future of Ohio threatened. Democratic Attorney General candidate Steve Dettelbach raised almost twice as much as his Republican opponent, Ohio Auditor Dave Yost, during the August fundraising period. Dettelbach raised $609,721 while Yost raised $368,677. #6: And, lastly, on Steve Dettelbach’s landmark work and historic leadership on battling the opioid crisis, then as US Attorney and, come November, as the next Attorney General of Ohio. Justin Herdman, U.S. Attorney for the Northern District of Ohio, described a conference last week hosted by the U.S. Attorney’s Office and the Cleveland Clinic entitled “Opioids: A Crisis Still Facing Our Entire Region.” Steve Dettelbach originally set up the conference. U.S. Attorney Justin Herdman: US Attorney at the time Steve Dettelbach set up this conference. I think it was probably one of the first in the country that really brought together people from across various communities, law enforcement and provider and treatment. COLUMBUS (September 11, 2018) – On Thursday, Sept. 13, Ohio State Bar Association (OSBA) President Robin Weaver will honor Ohio Supreme Court Chief Justice Maureen O’Connor and Akron Municipal Court Judge Annalisa S. Williams with awards for judicial excellence and innovation at the Ohio Judicial Conference Annual Meeting at the Hilton Easton in Columbus. In a career spanning almost four decades of public service, Chief Justice O’Connor has had many roles including practicing attorney, magistrate, common pleas court judge, prosecutor, and Ohio Lieutenant Governor. She was first elected to the high court in 2003 and in 2010, she was elected Chief Justice, carrying all 88 Ohio counties. Upon her election, she became the court’s first female Chief Justice. The purpose of the Innovative Court Practices Award is to bring greater visibility to exemplary programs in Ohio’s courts and to facilitate the transfer of those programs to other courts in the state. Award submissions are evaluated on criteria including creativity, the newness of the program and its effectiveness, as well as the transferability of the concept to other courts and whether the program addresses significant issues that are regional in scope. OSBA President Robin Weaver will be presenting the Moyer Award and the Innovative Court Practices Award at the Ohio Judicial Conference annual meeting on Sept. 13, 2018, at 11:45 am, in the Easton Grand Ballroom of the Hilton Columbus at Easton.